The Salter Scale acts as a daily food diary and keeps track of your calorie intake. A cup of pasta has 200 calories, but 8 ounces of pasta has about 800! Want to know what your favorite foods caloric value is? 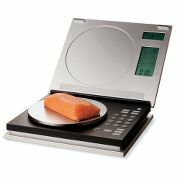 Then pick up a Salter Scale, available at www.hammacher.com.